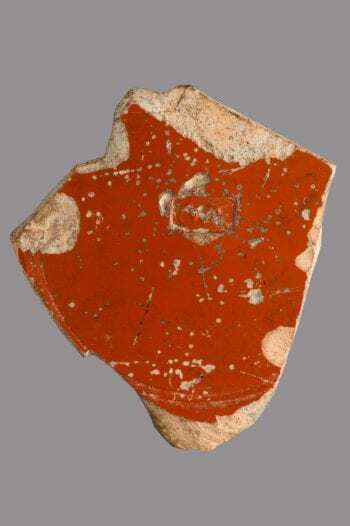 This fragment from a ceramic plate or bowl has a particularly thin fabric, perhaps connoting a finer ware of pottery. 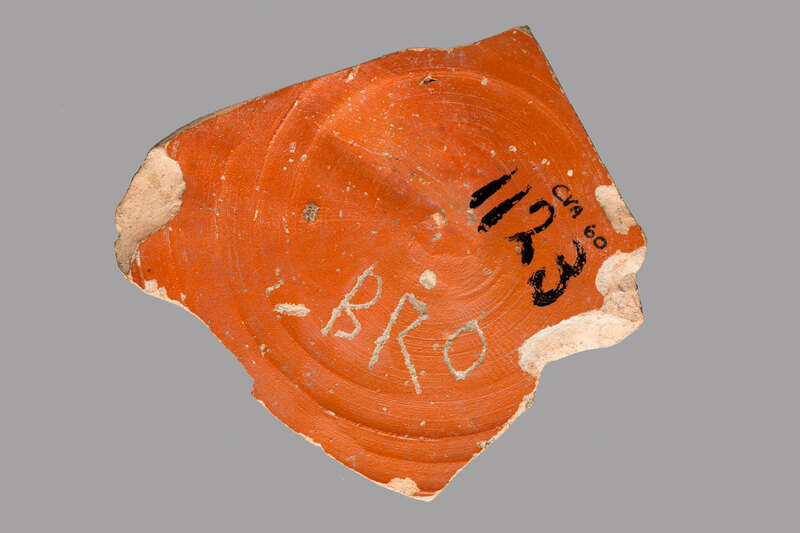 The base of the fragment has a lightly incised graffito which reads “BRO.” Note, however, that the right side of the ‘B’ has been formed in a linear pattern, a form which may evoke some versions of the Greek letter beta or a backwards, four-bar Greek sigma, perhaps suggesting the linguistic background of the inscriber, if not the difficulty of incision on fired ceramics. The interior of the vessel has a pottery stamp, “CNAE,” which may be linked to the workshop of Cnaeus Ateius, a central Italian potter with connections to workshops in France. Robinson, D.M., ed. 1936. Corpus Vasorum Antiquorum: United States of America, The Robinson Collection, Baltimore, MD. 3 vol. Cambridge, MA: Harvard University Press. Pg. 56, no. 2a-b, pl. XLIV, 2a-b.